Just in time for Valentine’s Day, one of my most beloved winery’s has added my favorite blend to the lineup. 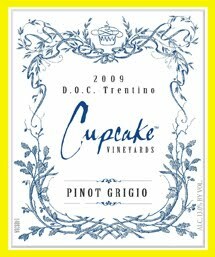 Cupcake Vineyard not only has my favorite word in its name (cupcake), but it also has some adorable, delicious wines. Yo dudes – if you are making a romantic dinner at home for your honey, then may I suggest the Red Velvet variety? She’ll be impressed and go gaga because the bottle is cute and girly. Shot of Brandi* also approves the Pinot Grigio, Sauvignon Blanc and Merlot.